Look for the eyes. They’ll tell you all you need to know. If they bug out too far, that’s how you know you’re dealing with an amateur. 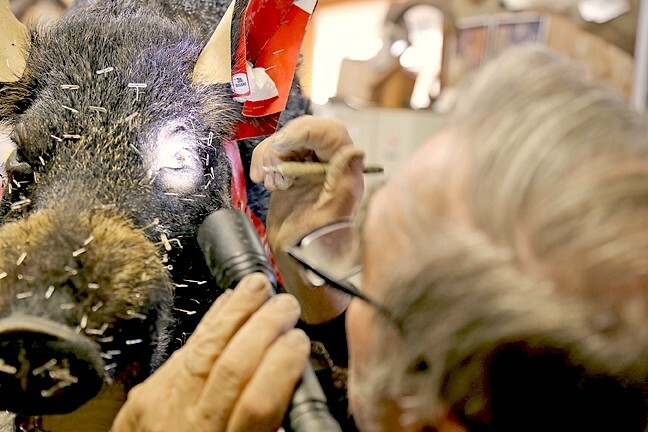 Don Anderson, who has been stitching skin to perfection on animal hides for more than 30 years in San Luis Obispo County, knows a thing or two about making a dead animal look alive. 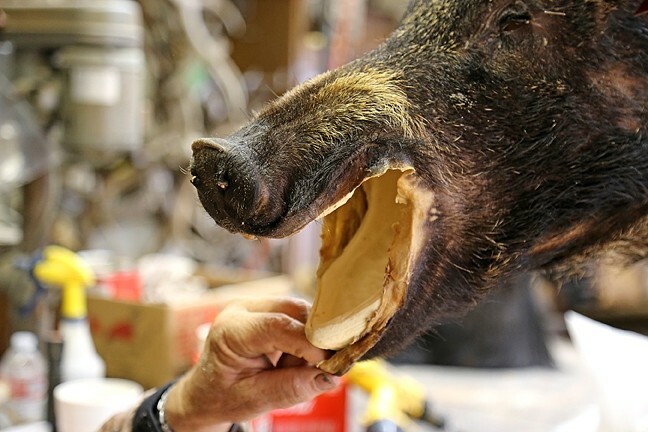 LOOK ALIVE: A boar hide goes from wet skin to mounted animal in the hands of SLO County taxidermist Don Anderson, who stitches leather around foam forms to turn them into art pieces. 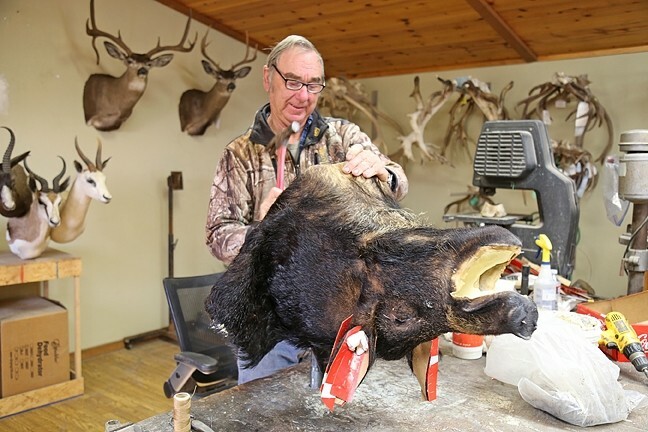 Don, 66, is a lifelong hunter, but he never planned on getting into the taxidermy game. He was mentored in the art of taxidermy by his now-deceased friend Bill Jardine in the late 1970s. One day, Jardine showed up in Don’s driveway with a truck full of hides and antlers and said, “I quit. Here it is. 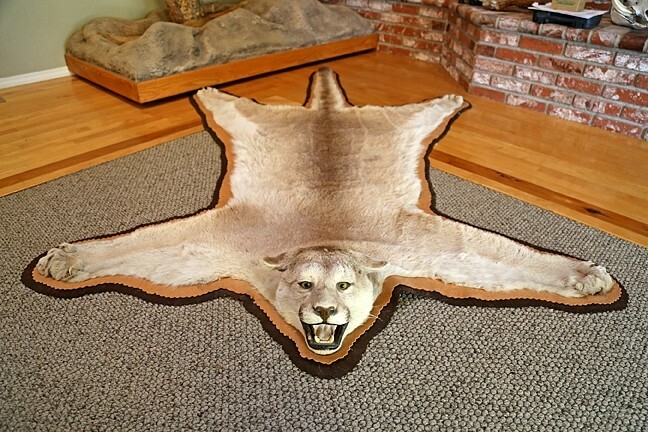 You can take over.” Don had just planned on doing taxidermy for himself, as a way to showcase the animals he hunted. But he scratched his head and told his old friend he’d give it a shot. 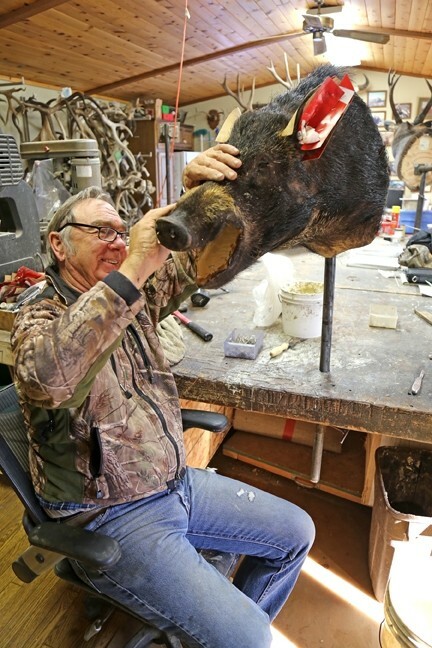 Today, Don is one of a handful of men who work as professional taxidermists in the county. 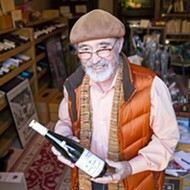 His workshop is located on his residential property tucked away on Old Morro Road in Atascadero. He also guides hunts for animals like desert bighorn sheep, free-ranging aoudad sheep, free-ranging sambar deer, blacktail deer, Rio Grande turkey, tule elk, Roosevelt elk, pig, and varmints. A good number of his taxidermy clients are hunters he’s guided, and many of them are repeat customers, looking to have the glory of the hunt forever immortalized. 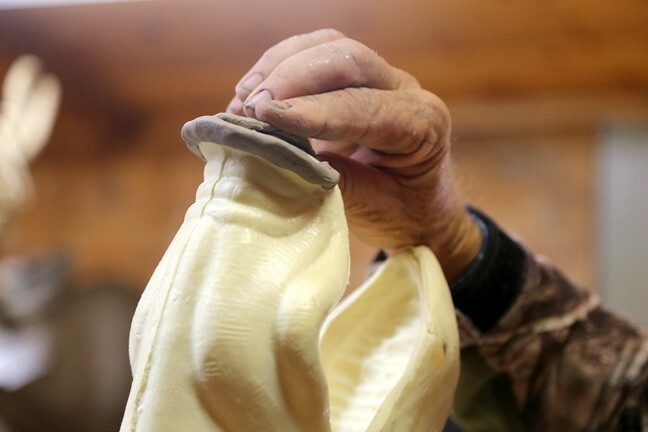 PERFECT CONTOUR: Don uses clay to shape the nose on the form he is about to mount the boar hide to. Don has mounted everything from a tiny weasel weighing in at a few ounces to a full-figured brown bear hailing from Alaska that weighed in at close to a thousand pounds. 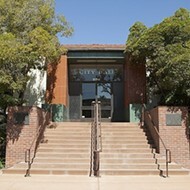 The life-sized mount of a mountain lion at the Charles Paddock Zoo in Atascadero is also his handiwork. His mounts can be found in trophy rooms in Pakistan, Switzerland, Belgium, Sweden, South Africa, Canada, Mexico, Costa Rica, and Russia. 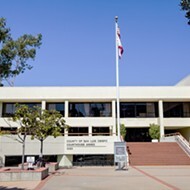 Homes from California to New York, Michigan to Florida, and places in between also hold Don Anderson-mounted boar, deer, sheep, and even zebras. 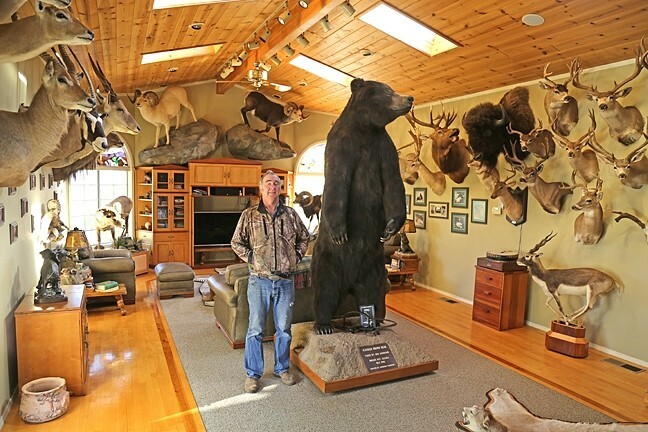 His own trophy room has maybe 50 mounts from his prized brown bear from Alaska to a mountain lion rug, mouth open and growling at your feet. Other taxidermists, like Dennis Berry of Wild Life Arts in Arroyo Grande, take another view on trophy rooms. 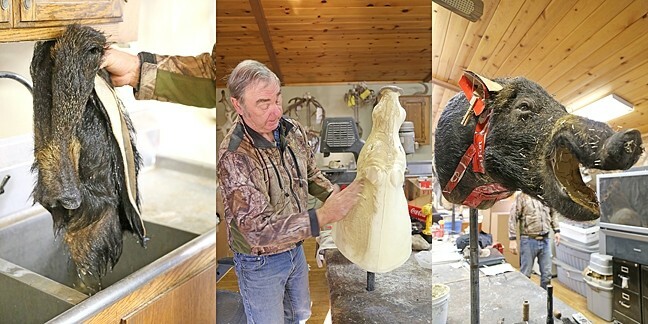 While his workshop is bursting with hides, antlers, and mounts, Berry has no trophy room or any trace of his craft at home. BITE WORTHY: Don carefully aligns the mouth of the hide to the mouth of the form he is using. But other hunters can’t stop at one trophy room. 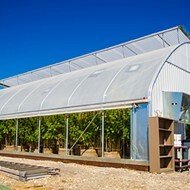 “Then there are people with more money than good sense, and they want everything life size mounted,” Rosemary Anderson, Don’s wife and business partner, said. One of Don’s friends in Palm Springs has 600 life-sized mounts of various animals that sprawl across three rooms in his home. Don said they make the bachelor and avid hunter happy. However, taxidermy is neither cheap nor instantly gratifying. A FULL HEAD: After the hide is properly placed over the form, the split parts of the hide are stitched together using fishing line. A shoulder mount of a boar would cost about $800, whereas a life-sized mount of, say, a deer would set you back about $3,500. Between a hunter bringing an animal for Don to mount and the finished product getting picked up, 10 months could easily go by. “Anyone can sew a hide up, but just to get the natural look of the eyes is what takes the longest,” Don said. Here’s how the process goes. A client brings an animal that he’s hunted in to Don, who then skins it and fleshes off all the meat, and salts and dries the hide. Animals mostly come in with the meat removed, but if not, then all the meat is returned to the hunters, who generally eat everything they shoot. The hide is sent to a tanner, where the hide is tanned, which with shipping takes about six months to return. When it comes back to Don, he soaks the hide in water overnight in preparation for affixing it to a polyurethane foam form. In the case of open-mouthed animals, fiberglass teeth are put in as real teeth will decay, and fake glass eyes that are hand painted are placed meticulously to mimic liveliness. A surprisingly small amount of the actual animal makes it onto the finished product. In the case of deer, real antlers are used, which adds an extra step of cutting off part of the skull and touching and discarding very real, slimy deer brains. This task doesn’t faze Don. 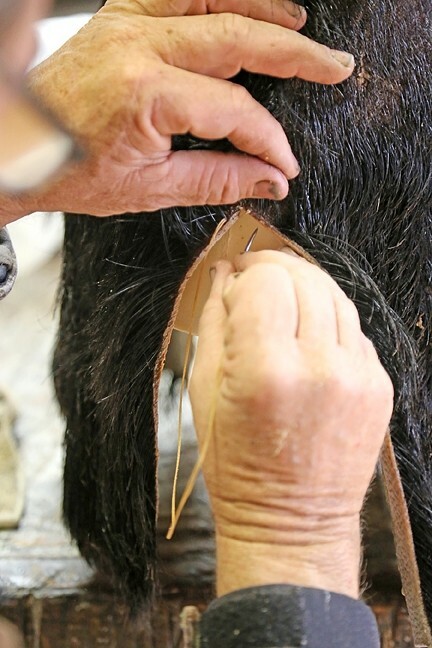 NAILED IT: The boar hide is affixed to the base of the form before Don gets to work on the details. One cold and bright morning in November, Don sits at a table in his workshop and places clay on the form of a boar in order to replicate the look of muscle tone, before wriggling the boar’s hide into place. The shop is filled with completed works of deer with massive antlers, their eyes staring deeply into your soul, along with racks of antlers that have been separated from their heads. A trio of mountain sheep hangs out together, their coats spotted with shades of black, gray, and rust. A boar’s head pokes through the wall, mouth open and teeth gleaming, looking as though it might stampede through the building. The hide of a zebra from Africa spills out over the top of a cardboard box. Don wears old faded jeans held in place with a shiny silver belt buckle with “Don” emblazoned on it, along with a camo print jacket and work boots. There’s dirt under his nails, but his shop is spick and span in spite of the fact that it’s a giant coffin of sorts. Don sews the boar hide up using clear fishing line instead of thread, using the same stitching pattern that’s used on baseballs. This boar shoulder mount is for a client in Los Angeles, who was hunting in the Parkfield area. DON’T MOVE A HAIR: Pinning the hide/skin to the form in many different places ensures that it stays in the proper place. Don pins his work in place as he goes along, with the aid of strips of cardboard from Coca-Cola (his favorite drink) boxes to help the form set properly. The boar will sit this way for anywhere from a week to a month, like a beauty queen sleeping with her hair in curlers the night before a big pageant. While Don mostly associates with other hunters, from time to time he does interact with people who don’t necessarily have an appreciation for his work, which is one of the reasons why his studio is on private property, rather than being in town. DETAILS: Don uses a flashlight to make sure the eyes are set just how he wants them. One of the most technical parts of taxidermy is getting the eyes to look realistic by making little adjustments. When it comes to hunting, Don and his wife view the activity as a lifestyle where they use as much of the animal as possible and are careful not to overhunt. Rosemary, who also hunts, said hunters help support the well-being of wild animals. OTHER PROJECTS: His workspace is filled with antlers, finished mounts, and skin that’s waiting to become lifelike again. And hunting, whether it’s done legally or illegally, isn’t all that cheap. Shooting a deer without a license could result in fines between $100 to $5,000, in addition to legal fees and potentially some jail time. 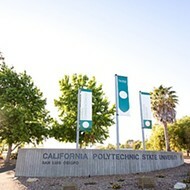 Only 11 to 20 bighorn sheep can be shot in California each year and the state auctions a tag each year for a desert bighorn sheep, which goes to the highest bidder. A few years ago, Don guided the guy who won. 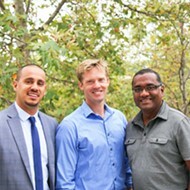 That guy paid about $170,000 to the state. All the money goes back into a program to help that species. “It’s kind of a once-in-a-lifetime deal if you ever did get a chance to hunt that animal,” Don said. 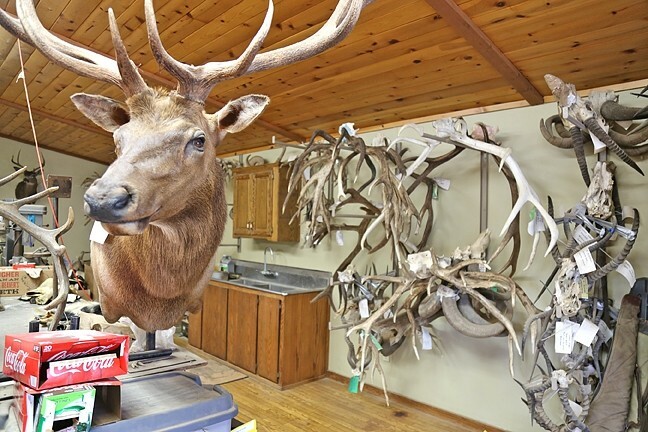 TROPHY ROOM: After a long day of taxidermy work, Don likes to relax in his living room with his wife and all his trophy mounts and watch television. The first rule of taxidermy club is no pets allowed. Every single month, Don gets multiple calls from grieving pet owners, asking him to immortalize their beloved Fido. And Don turns them all down. Berry from Arroyo Grande has a similar standard answer that he gives to people who call regularly asking him to mount their pets. Like other painters, sculptors, and craftsman, Don seeks to meticulously breathe the illusion of life into his creations. Ryah Cooley knows a few pigeons she’d like to send to the taxidermist at rcooley@newtimesslo.com.